EJIL: Talk! – Conferring ‘Market Economy Status’ to China in the EU – A Mission Impossible? Home EJIL Analysis Conferring ‘Market Economy Status’ to China in the EU – A Mission Impossible? Conferring ‘Market Economy Status’ to China in the EU – A Mission Impossible? The phrase highlighted in this quote is identical to language contained in Art.15(a)(ii) of China’s Accession Protocol (CAP) to the WTO. The provision is set to expire on December 11, 2016. This very fact has generated fierce debates in Europe and the United States that increasingly conflate the legal with the political dimension of the issue. The purpose of this post, in this context, is to scrutinize the legal effect of the expiry of the said provision on EU anti-dumping law and practice vis-à-vis China. Three days after the Franco-German initiative, the European Parliament (EP) passed a resolution on “China Market Economy Status” with broad inter-party support amidst manifestations of steel workers and trade union leaders outside the plenary in Strasbourg. “[A]s long as China does not meet all five EU criteria required to qualify as a market economy”, the resolution states, “the EU should use a non-standard methodology in antidumping and antisubsidy investigations on Chinese imports (…), in accordance with and giving full effect to those parts of Section 15 of China’s Accession Protocol which provides room for the application of the non-standard methodology”. In consequence, the EP “calls on the Commission to make a proposal in line with this principle”. This post questions the legal assumptions that the political positions quoted above rely on. The remainder of this post demonstrates that Art.15 CAP does not, after December 11, 2016, allow for the use of non-standard methodologies for price comparisons in anti-dumping investigations that are inconsistent with the provisions of the WTO Anti-Dumping Agreement (ADA). Should the Union follow the path to protectionism recommended by Berlin, Paris, and the EP, the EU will unmistakably violate its obligations under the ADA. In order to comply with its WTO obligations after December 11, 2016, in contrast, EU institutions need to bring EU secondary legislation and future anti-dumping measures against Chinese producers into conformity with the ADA. It is beyond doubt otherwise that the EU will be subject to a larger number of unfavorable legal decisions adopted by the WTO Dispute Settlement Body (DSB). In the aftermath of these decisions, in case of non-compliance, the EU will be confronted with hefty retaliatory measures authored by China and authorized by the WTO DSB. Art.15(a)(i) and (ii) reflect the presumption that Chinese domestic prices are generated under conditions of government-induced market distortions. Domestic prices generated under non-market-economy (NME) conditions make for a deceptive comparator of export prices in the determination of whether, and to what extent, a product has been dumped onto third country markets. The rationale for this presumption is straightforward: If Chinese domestic prices are artificially low due to non-competitive market conditions, a comparison with export prices in anti-dumping procedures would not allow for a determination of dumping at all, or result in the calculation of dumping margins and anti-dumping duties that are lower than under competitive market economy (ME) conditions. It follows from Art. 15(a)(ii) that WTO members’ anti-dumping investigators may derogate from the price comparison requirements of ADA Art.2.2. if the Chinese producer under investigation cannot prove that ME conditions exist in the respective industry. The allocation of the burden of proof, however, makes for a formidable obstacle for the producer under investigation: neither WTO law nor the CAP define the concept of “market economy conditions”. WTO members were thus free to determine criteria for the conferral of ‘market economy status’ (MES) to China under its national laws, either for the economy as a whole, or for specific industries. MES conferral to China, in other words, remained at full discretion of WTO members’ policy-makers for the time being. Throughout the past 15 years, Art.15(a)(ii) provided EU anti-dumping investigators in the European Commission with a wide margin of discretion in determining the existence and extent of Chinese dumping and created the legal basis for a highly effective trade remedy against Chinese exports: no less than 56 of the current 73 EU antidumping measures apply to imports from China. “d) Once China has established, under the national law of the importing WTO Member, that it is a market economy, the provisions of subparagraph (a) shall be terminated provided that the importing Member’s national law contains market economy criteria as of the date of accession. In any event, the provisions of subparagraph (a)(ii) shall expire 15 years after the date of accession. Interpreting the provisions of Art.15(d) in conjunction with Art.15(a), the WTO Appellate Body (AB), in paragraph 289 of EC-Fasteners, opined that Art.15(a) is a time-bound derogation from the ADA. Until December 11, 2016, China had the opportunity to establish MES for the purposes of price comparisons under the ADA for the entire Chinese economy (Art.15(d), 1st sentence) or individual sectors (Art. 15(d), 3rd sentence). The two provisions, however, only applied vis-a-vis countries that had enacted laws and regulations providing for criteria of MES conferral prior to 2001. It is noteworthy that the EU did not maintain legal criteria for MES conferral at that time. Notwithstanding China’s right to early termination of the ADA derogations laid down in Art.15(a), the AB interpreted the expiry of Art.15(a)(ii) – codified in Art.15(d), 2nd sentence – as WTO members’ erga omnes obligation to apply the disciplines of the ADA on an unconditional basis, starting on December 11, 2016. After this deadline, WTO members’ use of methodologies other than those consistent with the ADA run foul of their obligations and expose respective practices to legal challenge at the WTO. With the December deadline looming, Western industries have become increasingly wary of the loss of a highly potent trade defense remedy in the post-2016 scenario. Such anxieties have resulted in spillover effects that inspired innovative legal thinking among some trade defence lawyers. Ever since, the prevailing legal opinion on the interpretation of Art.15 CAP, as expressed by the AB in EC-Fasteners as well as numerous reputable legal scholars (see, e.g. Tietje & Nowrot) and practitioners (e.g. Graafsma & Kumashova), has become the target of intense opposition advanced by EU industry associations, politicians, and some legal practitioners. One opposing view contends that the remaining provisions of Art.15(a) and Art.15(d) make for an indefinite presumption of NME conditions in China even after the expiry of Art.15(a)(ii). The ADA derogations of Article 15(a), the story goes, are permanent and render China a NME forever and ever after, unless otherwise established under the national laws of WTO members in accordance with Art.15(d), 1st and 3rd sentence. This alternative and – among industry interest group representatives – increasingly popular reading of Art.15 is based on the assumption that Art.15(a) has a broader scope than Art.15(a)(ii), which expires in December 2016. After that date, the introductory sentence of Art.15(a) allowed WTO members’ to choose between ADA and NME price comparison methodologies, if China cannot establish MES under Art.15(d). Art.15(a)(i), likewise, affirmed the continued presumption of China’s NMES. A narrow textual interpretation of Art.15(a) following the expiration of subparagraph (ii) could mislead to the inferential conclusion that the use of alternative price comparison methodologies remains permissible under Art. 15(a)(i) if producers cannot clearly show that ME conditions prevail in the industry under investigation. An isolated reading of subparagraph (i), however, would preclude an effective interpretation of paragraph (d), 2nd sentence, which triggers the expiration of Art.15(a)(ii). Inferring the permission to use alternative methodologies from (i) would leave the expiration of subparagraph (ii) via paragraph (d), 2nd sentence, without any legal effect on WTO members’ rights to use alternative price comparison methodologies. Such a reading of Article 15(a) would not only ignore the immediate legal context but also violate the principle of effective treaty interpretation in regard of paragraph (d), 2nd sentence, which the AB articulated in US-Gasoline (para23). A less radical line of thought proposes that the expiration of Art.15(a)(ii) merely shifts the burden of proof in regard of MES conditions (and NMES conditions respectively) from China to the investigating WTO member. Art.15, however, does not give any textual indications to this end, neither prior to nor after December 11, 2016. It is, moreover, highly questionable whether the purpose of the CAP, in general, and Article 15(a) and (d) in particular, is to permit a permanent discriminatory legal treatment of Chinese producers in derogation from the WTO’s ADA. To the contrary, as Graafsma & Kumashova point out, both then USTR Charlene Barshefsky (in a hearing before the US House of Representatives) as well as the European Commission (in its submission to the WTO panel in EC-Fasteners) have publically voiced their understanding that China will automatically receive ME status for the purposes of the ADA in December 2016. It is beyond doubt that evidence of official positions expressed by the drafters of the CAP will be taken into account by WTO panels and the AB in future proceedings. In order to bring EU secondary legislation and future EU antidumping measures and practice in conformity with the ADA by December 11, 2016, the European Commission ought table a legislative proposal as part of the envisaged EU TDI reform – or separately – in the near future. At the minimum, the Commission will have to propose China’s removal from the list of NMEs in Art.2.7. of the EU Anti-Dumping Regulation (ADR). It is the constitutional prerogative of the EP and the Council to amend such a legislative proposal in the course of the EU ordinary legislative procedure (OLP). The political positions cited above indicate that the process of bringing EU anti-dumping legislation and practice in conformity with WTO law could prove to be a mission impossible, moving the Union onto a legally unviable path of industry protection. The likely bilateral political repercussions of ignoring EU obligations vis-à-vis China under international economic law (in order to afford short-term protection to an uncompetitive industry) should give rise to serious concerns. EU policy-makers should also carefully consider the systemic implications of their decision. Rather than frustrating WTO members’ credible expectations that are anchored in negotiated legal disciplines, EU political institutions should fully exhaust the sufficient alternatives of WTO consistent trade remedy design and practice under the ADA as well as the SCM Agreement and promote social mitigation strategies for industrial sectors in decline. 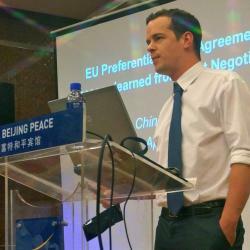 Comments Off on Conferring ‘Market Economy Status’ to China in the EU – A Mission Impossible?